One of the staging areas for large groups of Tundra Swans is located at the Aylmer Wildlife Management Area in Ontario, Canada. They refuel on their migration to the high Arctic Region around this time of year. Thousands of them congregate here and are fed corn twice a day. The management area reduces the amount of corn dropped for the swans to encourage them to move on. Southwestern Ontario is situated en route where these birds are often observed flying overhead, or on the ground feeding on the grassy berm adjacent to the ponds. 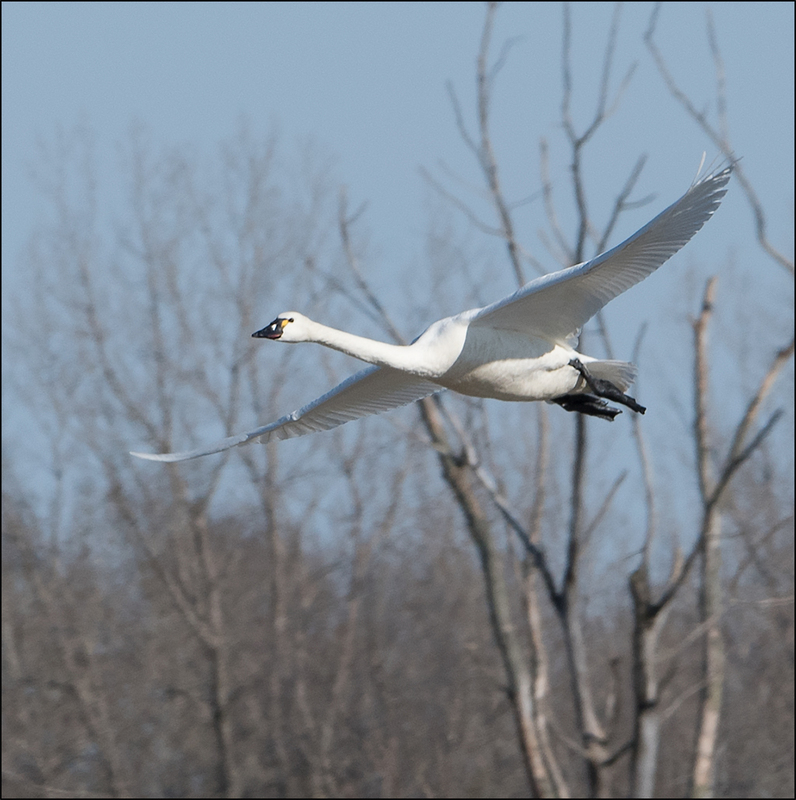 Aylmer Wildlife Management Area is the best place in Southwestern Ontario to view thousands of Tundra Swans. We saw about one thousand on our trip. 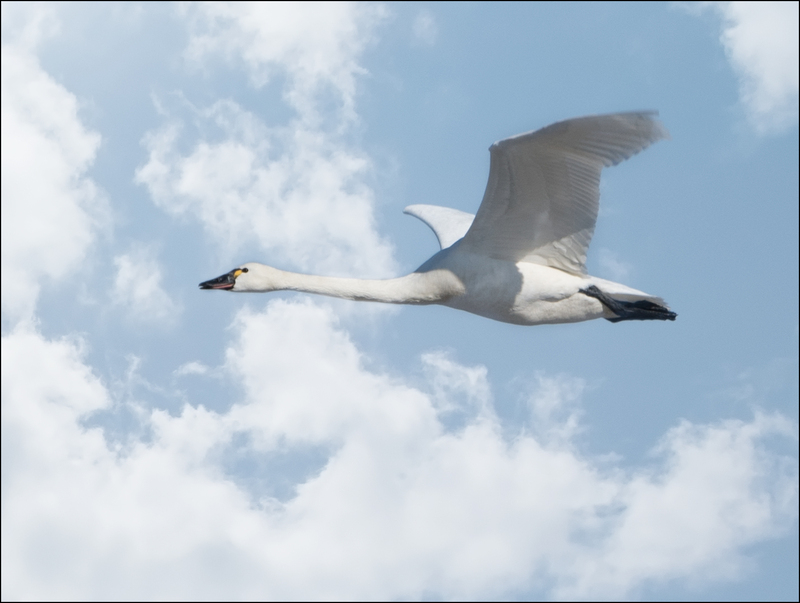 We had around a thousand Tundra Swan on the Niagara River this winter. Likely, they moved on to Western Ontario. The daily feedings provide the birds with nourishment for their long journey north, as well as keep them near to bird watchers by and on the elevated viewing stands. They fatten up on corn which helps them beef up for the long journey. We also saw a few blue morph Snow Geese and two Ross’s Geese. A pair of Sandhill Cranes were spotted at Long Point. I cannot recommend Aylmer Wildlife Management Area more. Whether a birder or not, seeing so many birds in one place is truly spectacular. 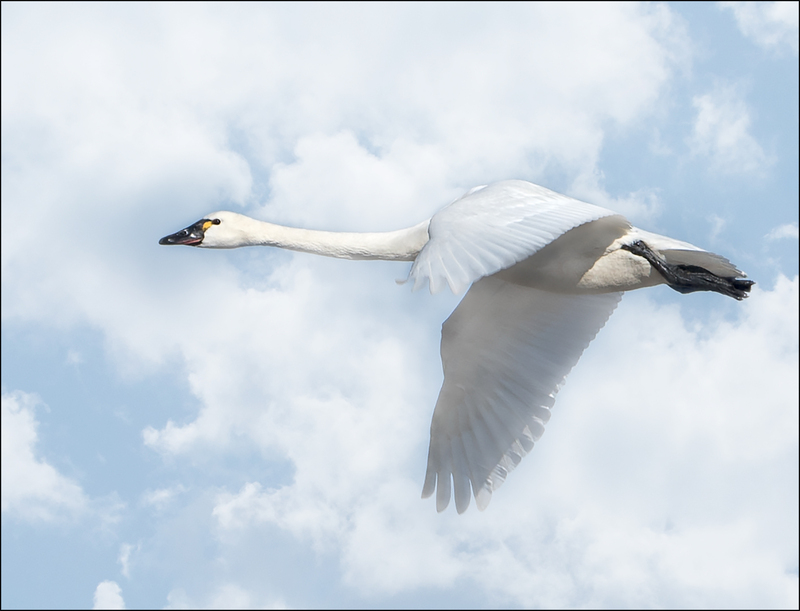 Each spring, thousands of Tundra Swans make their way from their wintering grounds on the Atlantic coast to their breeding grounds in the Arctic, crossing the Western NY and Western Ontario regions. If you get a chance to visit, don’t miss this beautiful sight. What a sight to see so many swans all at once! I bet it was noisy. It’s great to see people helping these birds, getting them plenty of nourishment before they head off on their long trip. Plus people get the added benefit of being able to observe them up close. 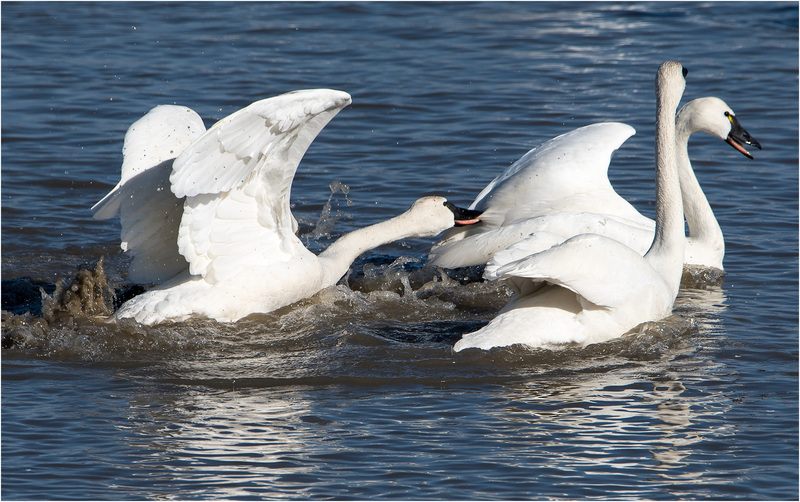 And perfect photos of the swans mid flight too! Thanks Sue. It really is amazing there are so many. Thank you. I was over in Eastern Europe a few years ago and remember seeing a number of swans. I was not in Poland though, just close. I think your first photo of the goose in flight is pretty amazing. All that white and still the bird is not lost in the clouds (so to speak). I’m guessing bird photographers probably prefer a fully open wing span but I like the downward thrust. To me it implies action better than the open spans. I like the wings this way too, even on my eagle shots. Not so good in a camera club competition though. Some reason the judges, who do not shoot wildlife, seem to like the full spread of the wings. Lovely to see them in flight, will check out the local spots to see if they are around. Yes, every chance I get for flight shots. Wow, what a beautiful sight to behold Donna!, it blows me away that you have such beautiful birds at your back door, and so many! Thank you. The Niagara River gets a lot of birds. Birders from around the world travel here, not in great numbers, but to get birds for their lists. It must have been marvelous to see them in person! Thanks for sharing. Yes Connie, in those numbers it is wonderful to see. This year on the river from GI I saw maybe 1000. We have that in skagit valley too. Haven’t made it up this year. It is really cool though like your place you took these pics. I am planning a visit to the Skagit River sometime soon for eagles. There is another WA River too having the most eagles anywhere. A friend of mine does trips there. Might go on that trip. Wow wow and more wow! I would love to see this!